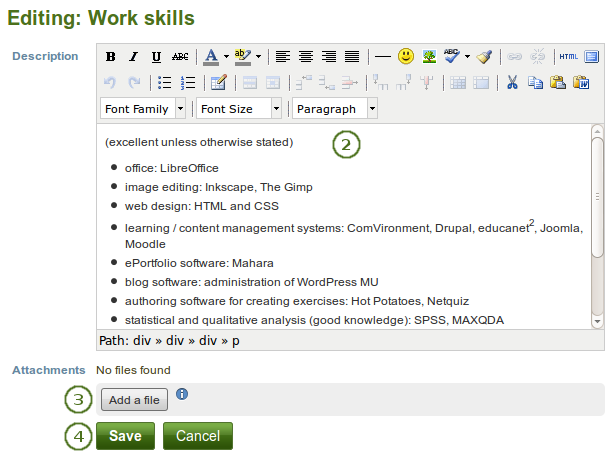 The visual editor allows you to write and format your résumé. 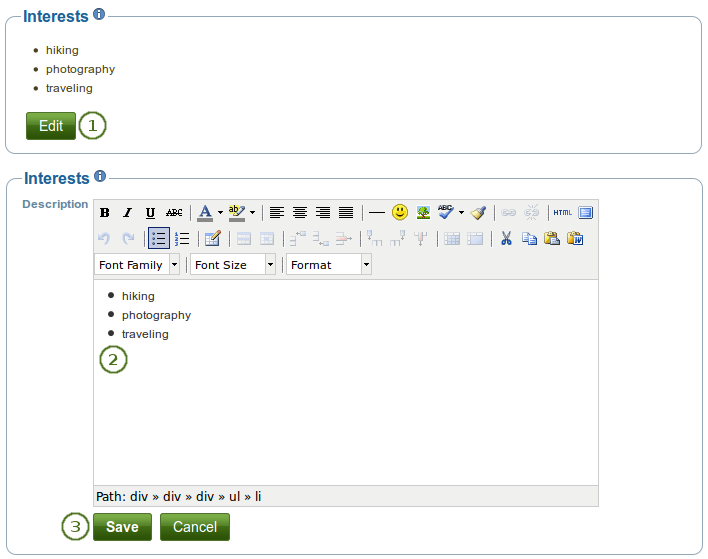 There is also a spellchecker installed which will check for any misspelt words once you click the Spellcheck button . 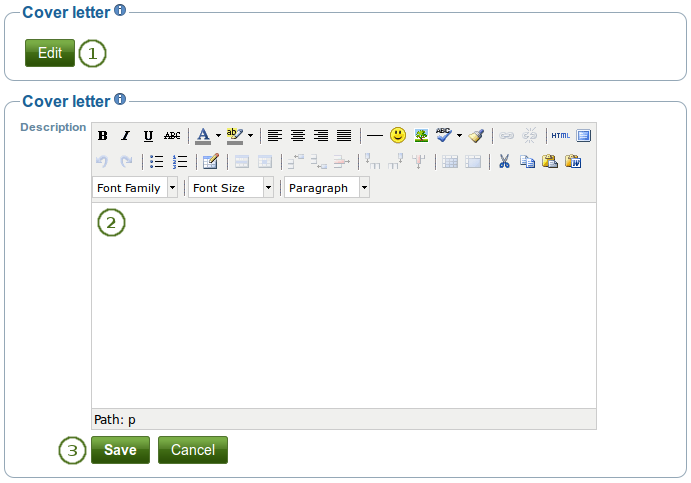 If you write your cover letter or any other text in Microsoft Word instead of directly in the editor in Mahara, please use the Paste from Word button to strip out most of the formatting code that Word puts into a document but can interfere online. Date of birth: Either choose your date of birth via the calendar icon or enter it in the format YYYY/MM/DD, e.g. 1978/01/30 when you want to say that you were born on 30 January 1978. Gender: Select the one that applies to you. (Not specified): Select this option if you do not want to identify with any of the other genders. Female: Select this option if you identify as a woman. Male: Select this option if you identify as a man. None of the fields in the Personal information are required. You do not need to provide any of that information if it is not required in your portfolio. Decide wisely, which of the above information you want to make available to others. Click the [+] link to attach more files. Start date: The start date is displayed as you entered it. End date: The end date is displayed as you entered it. Qualification: Your qualification along with the institution is shown. Attachments : This column displays the number of attachments you have per item. Use the Edit button to make changes to an entry. Use the Delete button to delete an entry. Position: Your position along with the employer is shown. Date: The date when you received your certification, accreditation or award is displayed. Title: The title of your certification, accreditation or award is shown. Date: The date you provided for your publication is displayed. Title: The title of the journal or book in which your contribution appeared is shown along with the title of your contribution. Any details about your publication are displayed. The URL you provided for your publication. Any attachments you uploaded to your publication. Title: The title of the organisation is displayed. 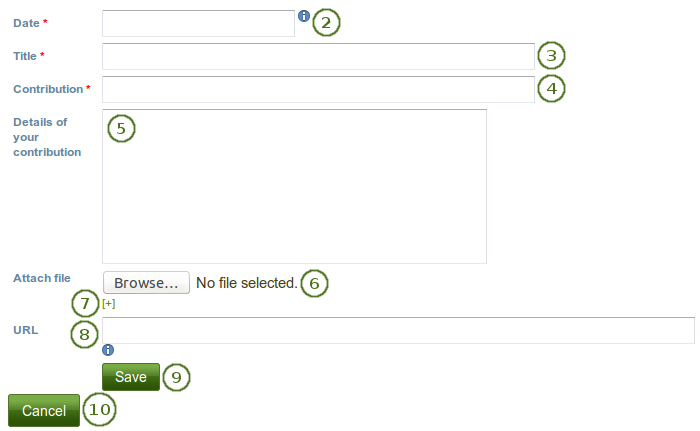 If you entered additional information, you can click the link and display it. The three different goals areas are displayed. 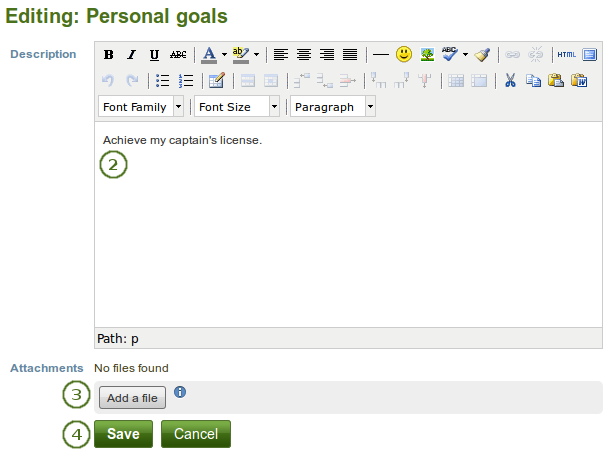 If you already filled in goals, there will be a link for you to click and see them. The areas where you have not yet provided goals are not linked. Click the Edit button to enter a goal in one of the three goals areas. Write down your goal(s). You can come back at any time and edit them. 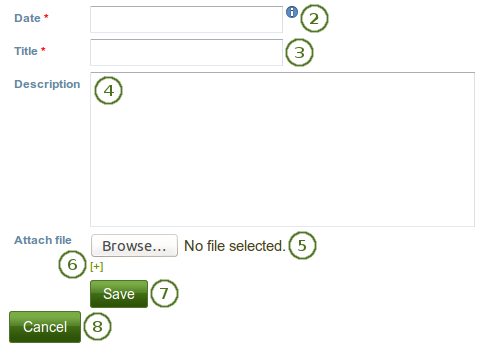 Attach file: Click the Attach a file button to upload a file or attach one from your Files area. 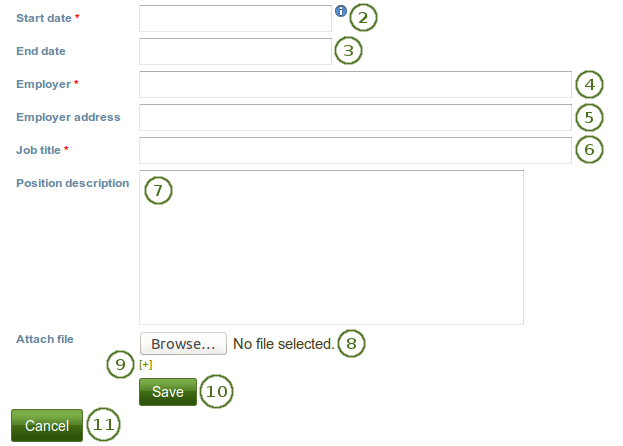 Click the Save button to keep your changes or click the Cancel button to abort. The three different skills areas are displayed. If you already filled in skills, there will be a link for you to click and see them. The areas where you have not yet provided skills are not linked. Click the Edit button to enter skills in one of the three skills areas. Write down your skills. You can come back at any time and edit them. Licensor: You see this field if the site administrator turned on license metadata. If you created the résumé of someone else, you can attribut the work to them here and provide their name for example. 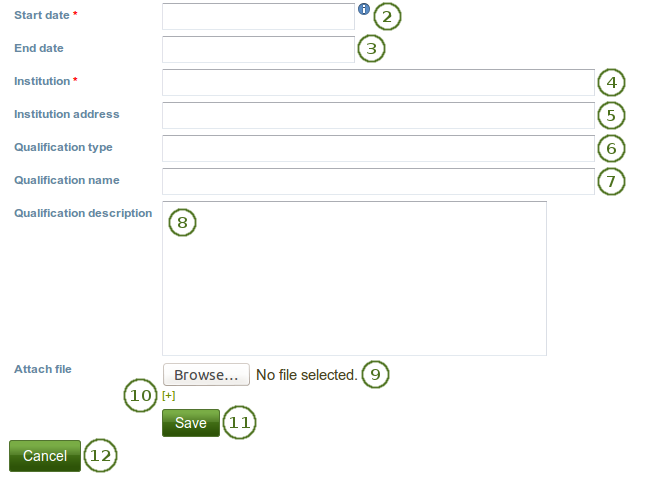 Original URL: You see this field if the site administrator turned on license metadata. If the résumé had been posted somewhere else before, provide a link to the original Internet address so that others can go there and view the original résumé.